Be the first to share your favorite memory, photo or story of Lakeena. This memorial page is dedicated for family, friends and future generations to celebrate the life of their loved one. Miss Lakeena Nicole Grant, 37, entered into eternal rest on September 20, 2018 at Memorial Health University in Savannah, Ga. She was born on August 25, 1981 in Augusta, Ga. She was the daughter of Felicia M. Fillmore Fair and James Grant, Sr.
She was reared in Tattnall County, Ga. and was a 1999 graduate of Tattnall County High School. At an early age she accepted Christ and was a member of New Fellowship Missionary Baptist Church in Glennville, Ga. where she sang in the choir. 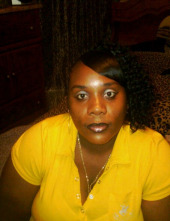 She was formerly employed at the NCO Academy Ft. Stewart, Ga. She will be fondly remembered by her fiance' Jarvis Lemon. One son Jarvis Lemon IV (Little J) of Claxton, Ga., her loving mother Felicia M. Fair; a devoted Father James Grant, Sr., a caring step-father Hubert Fair of Glennville, Ga. A caring step mother Theresa Grant; doting sisters Tanesha Mobley and Kristy McMillian; three affectionate brothers, James Grant (Sophia), Kqumane (Meisha) Grant, Cerrell (Sheronda) Mobley, Jermaine (Nicole) Scott, stepbrothers' James Smith and Dontae Melvin; mother-in-law pastor Christine Bailey; twelve aunts, ten uncles and a host of neices and nephews. Two special friends Keisha Lewis and Tabitha Slack. She will also be missed by neices, nephews, cousins other relatives and friends. To send flowers or a remembrance gift to the family of Lakeena Nicole Grant, please visit our Tribute Store. "Email Address" would like to share the life celebration of Lakeena Nicole Grant. Click on the "link" to go to share a favorite memory or leave a condolence message for the family.